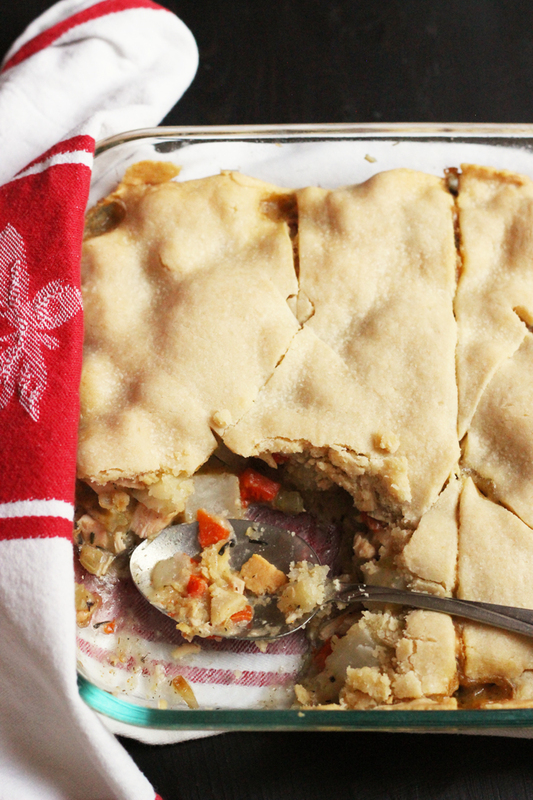 This Single Crust Pot Pie comes together quickly, particularly if you’ve got holiday leftovers. Be sure to add it to the rotation for this holiday season. What says cozy, cold-weather dinner than a chicken pot pie? I’m not sure there is anything more comforting. Flaky pie crust, creamy sauce, succulent chicken and veggies – what could be better? This is one of my family’s favorite recipes, and a Single Crust Pot Pie is really so simple. It’s an ideal casserole to make this holiday season, especially if you’ve got leftovers from a roast chicken or turkey. Serve it with a simple side salad, and you’ve got the perfect weeknight meal! I love this particular version for it’s mirepoix and mushroom base that adds such a woodsy, fall flavor to it. But I’ll tell you a secret. Chicken Pot Pie, single crust or not, can be very labor-intensive if you’re making it all from scratch just for one dinner pie. The homemade sauce, the freshly cooked veggies and chicken, the delectable pie crust — they are must-makes, but they do take some time. I have two pet strategies that will allow you to enjoy this Single Crust Pot Pie all winter long. 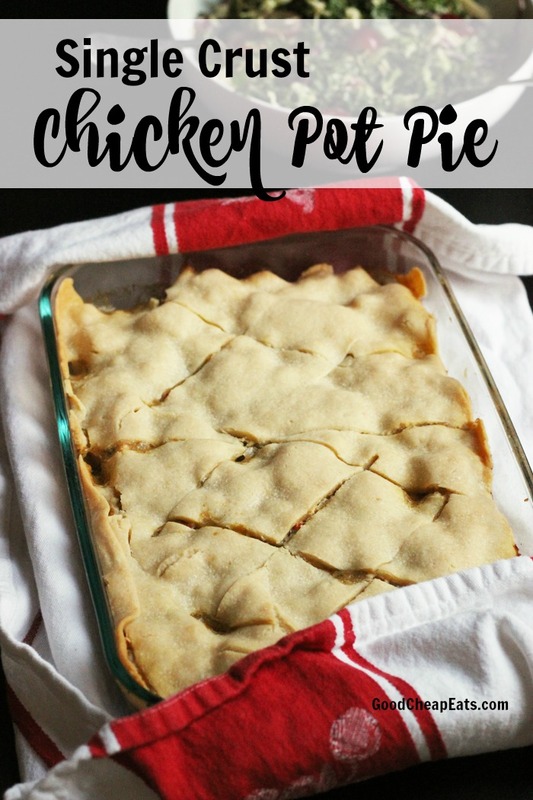 Make many chicken pot pies at once. You knew you could freeze chicken pot pie, right? It’s great for freezing. Make several at one time so that your time investment is well served. Make a large batch of Homemade Cream of Chicken Soup, cook up a bulk batch of potatoes and chicken, and get to sauteing the mirepoix and mushrooms. Chill the filling and then assemble several pies to freeze. Be sure to use red potatoes for best texture after freezing. Another great strategy for making this Single Crust Pot Pie is to plan for leftovers the next time you roast a chicken or turkey. Ding. ding. ding. Think about the upcoming Thanksgiving dinner. You’re likely already cooking potatoes, roasting turkey, chopping vegetables, and rolling out pie crust. Slip the different components of this dish into your Thanksgiving Prep. Chop extra onions, celery, carrots, and mushrooms when you’re making other dishes. Set aside enough cooked potatoes before you mash the rest. Chop up some turkey when you’re putting away the leftovers. Serve Homemade Cream of Chicken Soup for Cooking as your gravy and be sure to make lots! (Secret’s out. It really is just a creamy gravy.) Or you can just use leftover gravy instead of my creamy sauce. 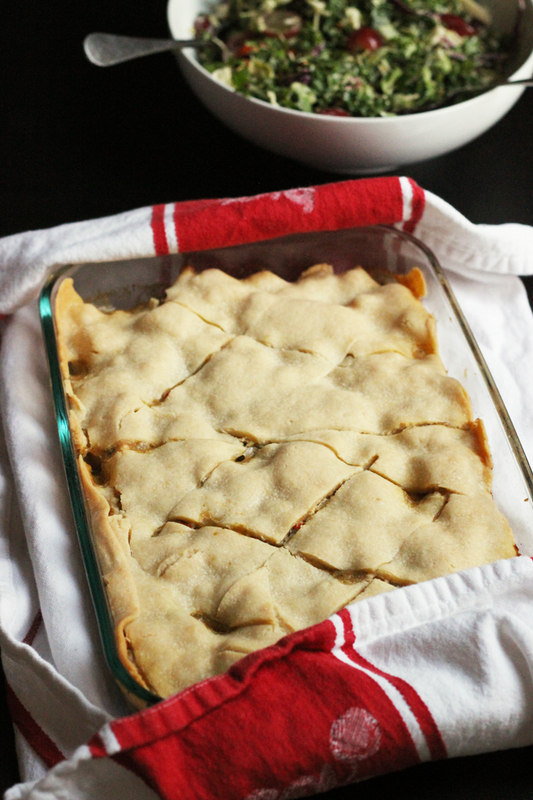 Make extra pie crust and stash it in the fridge while you’re making your other pies. See? Make your pot pie indulgences easy peasy. Stock up on ingredients when they are on sale. For instance, when I see a great price on veggies or chicken stock, I’ll buy lots of them and plan my meals around them. Use a whole chicken! Cooking a whole chicken (or buying one that Costco roasted for you) can be more economical than buying chicken pieces. Plus, you can use the carcass to make homemade stock. my favorite skillet – I love this size and style. It’s perfect for a quite saute of veggies. I have two! Preheat the oven to 375 degrees. Spray a 9×13-inch baking pan with nonstick cooking spray. In a large nonstick skillet, heat the oil until shimmering. Add the onion, celery, mushrooms, and carrots. Saute on low for 15 minutes until the vegetables are tender and caramelized. Season to taste with salt and pepper. Meanwhile, simmer the potatoes in salted, boiling water if you don’t already have leftover cooked potatoes to use. In a large bowl, combine the cooked vegetables, cream of chicken soup, chicken, and herbs. Pour this mixture into the prepared baking dish. Cut a few vent holes and bake for 45 to 60 minutes until the crust is golden brown and the filling is bubbly. If baking a frozen pie, do not thaw. Place the pie in a 400 degree oven for 15 minutes. Then reduce the heat to 375 degrees and continue baking until done, about 45 minutes more. We love chicken/turkey pot pie. I also make a beef pot pie with leftover pot roast once in a while. I also make mine with just a single crust. But as you said, it can be a labor intensive meal to make. This is probably the reason I only make it one time during the winter. It is always so cozy and comforting and makes the house smell so good. But you are right when you say it freezes well. I many times freeze the leftovers if there are any after we’ve eaten it for two nights. It’s usually only enough for hubby to take for lunch but it tastes just like the first day. I’ve never frozen the leftover pie. (There usually isn’t any. lol!) But, I’ll keep this in mind. I made your pie crust from your cookbook tonight with great success! It’s similar to this one, but only 1 cup of flour with more for dusting. This is my first success with pie crust and I’m pretty proud of myself! ?? I made this as part of my week long meal plan with a whole chicken!! 1. Roasted whole chicken, gravy, green beans, roasted 13×9 pan of onions, potatoes, carrots. Thanks! Yes, I sometimes do that, I’m just usually so frazzled at dinner time, I forget. Thanks for the reminder!